At Hobsons, we are committed to helping students succeed by connecting what they are learning in school to what they want to do in life. We do this by encouraging students using Naviance to identify their strengths, explore their career interests, set goals, and ultimately take ownership of their education plans. In listening to our community, we hear more and more about the importance of early preparation and academic preparedness. In 2012, we introduced PrepMe as an adaptive test prep solution integrated with Naviance. Today, we are proud to announce the next iteration of our test prep offering – Naviance Test Prep. Based on research proving the effectiveness of gamification in engaging students in test prep courses, our new solution equips both middle and high school students to learn critical concepts, and take each test with confidence. Naviance Test Prep will support students preparing for the new March 2016 SAT, and will replace PrepMe as our test prep solution. 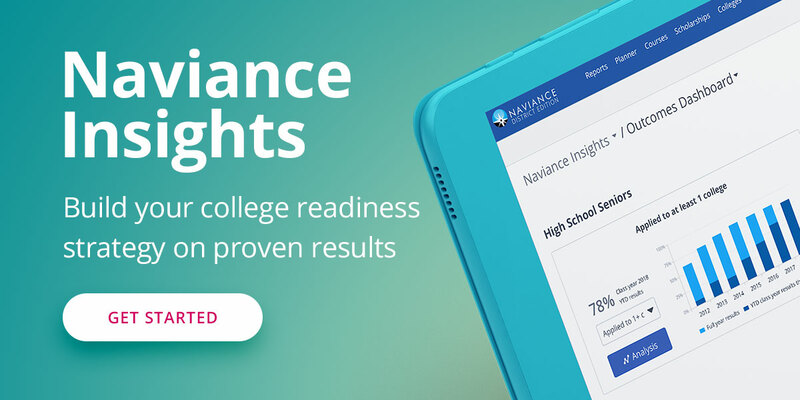 Naviance Test Prep features the latest high-quality content from McGraw Hill Education, Allen Prep, Cengage Learning, and MasteryPrep, aligned to Common Core and ACT standards and continually refreshed by subject matter experts. Educator-friendly, helping teachers and counselors identify students needing additional support and allowing district administrators to measure progress, by school and by classroom. I hope you will visit us online to learn more about Naviance Test Prep. We appreciate your ongoing partnership in helping students connect learning to life.